Suboccipital double barrel twin meningocoele: Another new theory? Meningomyelocoele (MMC) forms one of the commonest forms of neural tube defect (NTD). It commonly affects lumbosacral area. Double or triple MMC has been reported at various sites of the spine. This supports multiple site closure of neural tube. We report a case of double MMC located at back of head, adjacent to each other like twin MMC. To our best knowledge, such defect has never been reported in the literature and raises query of our current understanding of embryogenesis of NTDs. Multiple meningomyelocoele (MMC) is a rare entity. There are a few reports in literature where double or triple MMC has been reported by various authors. ,,,,,,, In all these reports, a swelling of one level has been associated with another at a level higher or lower to each other. Moreover, all these reports are on concomitant occurrence of two or more swellings at two different levels of spine. We came across a rare case where two such swellings were located in suboccipital region, were adjacent to each other, almost symmetrical giving a double barrel appearance. Such observation may help in the future for a better understanding of embryogenesis of neural tube defect (NTD). Three-month-old male child presented with two swellings at back of head since birth. The swellings measured 5 Χ 6 cm and 5.5 Χ 6.5 cm, and were adjacent to each other without any connection at the base. The swellings were soft, transilluminant and had positive cough reflex. The skin over the swelling was complete and normal. Head circumference was 36 cm, and anterior fontanelle was open. There was no discharge from either of the swellings [Figure 1]. The antenatal ultrasound had suggested a single swelling at neck. 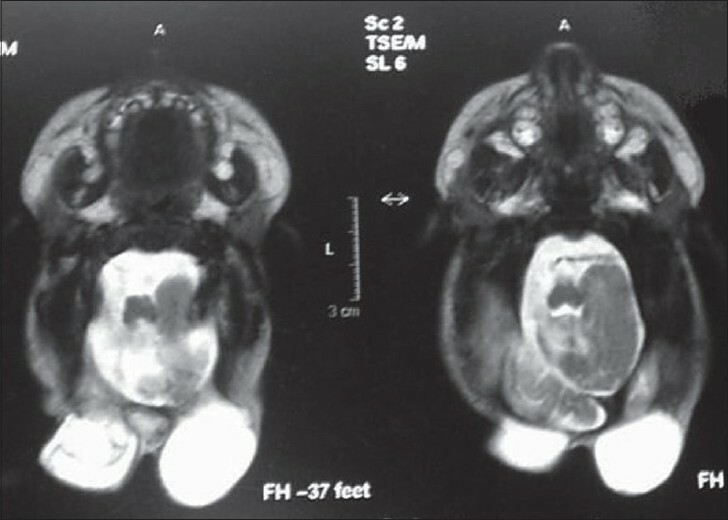 Magnetic resonance imaging (MRI) scan revealed two sacs separated by a small piece of occipital bone, filled with cerebrospinal fluid (CSF) in suboccipital region, with no evidence of any brain tissue in it [Figure 2]. There was no evidence of Arnold-Chiary malformation or hydrocephalus. Patient was operated under general anesthesia in prone position. Transverse skin incision was given. There were two small bony gaps, one each of the swelling in the occipital bone. Operative observations included two separate sacs of CSF, with the left one larger than the right one, and with no communication of two sacs with each other. The small piece of bone in between the two swellings was nibbled out and both sacs were converted into single sac at the base [Figure 3]. The repair was done joining the two sacs as a single opening covering the central communication. The child had a good recovery and had no hydrocephalus at follow-up of 2 years. At stage 10, further development results in the neural folds' elevation, approach and finally fusion in mid line to form neural tube. This process is called as primary neurulation. Fusion begins in cervical region and proceeds in the cephalic and caudal directions until the tube remains open only at small areas at both ends, i.e., anterior and posterior neuropores which close by 25 th and 27 th days, respectively. The lowest part of spinal cord is formed by secondary neurulation. The popular theory is that MMC originates from defective closure of caudal neural tube between 26 and 28 days of gestation. , By this theory, however, there can only be two sites of NTDs - the sites of anterior and posterior neuropores. However, recently, multiple initiation sites of neural tube closure have been demonstrated in mice and other animals. In humans, Van Allen et al. proposed a multisite neural tube closure model in which five closure sites have been shown to be existing in the neural tube of human embryo. The multisite neural tube closure model suggests the existence of five separate closure points, or "zippers," in normal neural tube in humans. In other words, it indicates the existence of additional neuropores, which are the most frequent site for the defect. These five different "zippers" span the length of the neural tube and function to close it during development. For different levels of defects, the perturbation in the neurulation process occurs in a defined part of the neural tube. These zippers are presumably under the control of one or more genes, mutations in which would cause NTD in the region of that zipper. , This may explain the embryogenesis of concomitant double meningocoeles. However, Tomoko Nakatsu et al. studied human embryos and found that human neural tube closure sites were different from those of other species. He examined human embryos in which the neural tube was closing grossly and histologically and observed that closure initiates at multiple sites. 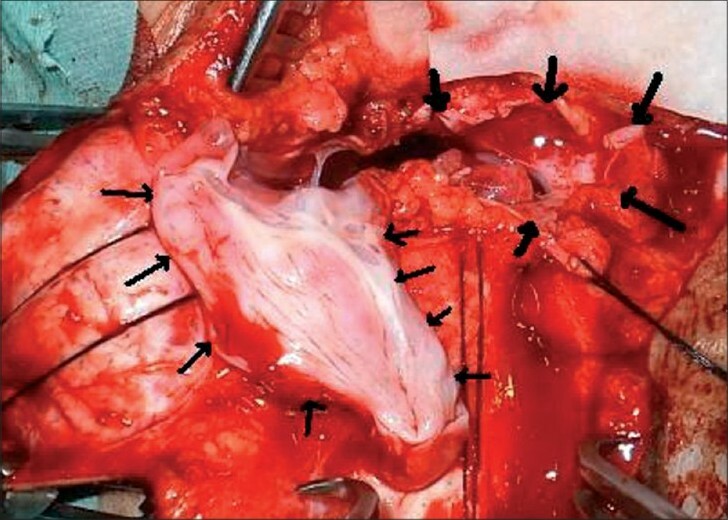 In addition to the future cervical region that is widely accepted as an initiation site of neural tube closure (site A), the mesencephalic- rhomboncephalon boundary (Site B) was found to be another initiation site. The second closure at site B proceeds bidirectionally and its caudal extension meets the first closure from site A over the rhomboncephalon. The rostral extension of second closure (site B) meets another closure extending from the rostral end of neural groove (site C) over the procencephalon where anterior neuropore closes. It may also suggest that fusion at cephalic level can be in two separate tracts in a Y-shaped manner, the failure of which may result in double barrel defect as in our case. It is a unique case - first in the world which certainly opens rethinking on mechanism of NTDs. The two sacs are adjacent to each other, almost symmetrical in shape and size, and are separated by a part of the occipital bone suggesting the mesoderm involvement in restricting the communication between the two sacs. 1. Potter EL. Pathology of the foetus and infant. Chicago: Year Book Medical Publishers; 1962. p. 571. 2. Fahrenkrug A, Hojgaard K. Multiple par vertebral lumbar meningocele. Br J Radiol 1963;36:574. 3. Rainov NG, Heidecke V, Burkert W. Thoracic and lumbar meningocele in neuro gibromatosis type I. Report of two cases and review of the literature. Neurosurg Rev 1995;18:127-34. 4. Gripp KW, Scott CI, Hughes HE, Wallerstein R, Nicholson L, States L, et al. Lateral meningocele syndrome: Three new patients and review of the literature. Am J Med Genet 1997;70:229-39. 5. Bertran V, Wilson C. Double myelomeningocele. Turk Journal of Pediatr 1968;2:88-90. 6. Durmaz R, Arslantas A, Ozon YH, Tel E. Double myelomeningocoele Turkish Journal of Paediatrics 2000;42:331-3. 7. Tekkok IH. Triple neural tube defect-cranium bifidum with rostral and caudal spina bifida-live evidence of multi-site closure of the neural tube in humans. Childs Nerv Syst 2005;21:331-5. 9. Sarda D, Kothari P, Laddha A, Kulkarni B. Double meningomyelocele: Embryogenesis. J Pediatr Neurosci 2007;2:26-7. 10. Bailey IC. Double meningocele. Arch Dis Child 1971;46:549-50. 11. Sadler TW. Langmans Medical Embryology in Central Nervous system. 10th ed. London: Lippincott William and Wilkins Co; 2006. p. 287-94. 12. Singh P, Soni A, Singh RJ. Double Meningocoel: Case Report. J Anat Soc India 2008;57:43-6. 13. Moore KL, Persaud TV. The Developing Human: Clinically Oriented Embryology in the Nervous system. 7 th ed. Philadelphia: WB Saunders Co; 2004. p. 431-42. 14. Van Allen MI, Kalousek DK, Chernoff GF. Evidence for multisite closure of neural tube in humans. Am J Med Genet 1993;47:723. 15. Nakatsu T, Uwabe C, Shiota K. Neural tube closure in humans initiates at multiple sites: evidence from human embryos and implications for pathogenesis of neural tube defects. Anat Embryol 2000;201:455-66. 2 Occipital encephalocele and spinal meningomyelocele in same patient: New theories hold true? Singh, D.K. and Singh, N.
3 Double neural tube defect: New theories hold true? 4 Occipital Encephalocele and Spinal Meningomyelocele in Same Patient: New Theories Hold True?